In 1995 Beecher celebrated its 125th birthday which is called a Quasquicentennial. A Quasquicentennial Commission was formed by the Village which consisted of volunteers and a number of special events were held to celebrate. A Quasquicentennial book was also authored by resident Shirley Biery commemorating the Village’s rich history. Below are links to the sections of the book broken down into seven chapters since the book is quite large for downloading purposes. A limited number of books are still available at the Beecher Community Library and can be purchased for $20 each. T.L. Miller arrived in Washington Township in 1862 and began purchasing land. His plan was to begin breeding and raising Hereford cattle. He knew the area offered good grazing lands; and he was convinced that the Hereford breed of beef cattle showed great promise for the future. At the time, T.L. Miller lived in Chicago and was in the fire and insurance business. Mr. Miller was a great admirer of Henry Ward Beecher, the most famous orator of that time, and named the new village after him. To further promote Hereford cattle, he established the “Breeder’s Journal” in 1880 and published it for eight years. In addition, he gathered and assembled the pedigree of Hereford cattle in the first two volumes of the “Hereford Herd Book”. Both were published in Beecher. Sometime after his initial purchase of land, T. L. Miller learned that the Chicago, Danville and Vincennes Railroad was coming through the area. He was able to acquire an additional 340 acres west of his original property and adjoining the proposed railroad on both sides. He secured the promise of a railroad station within his property. Early in 1869, work began on the new railroad. It would run from Chicago, through Danville and eventually cross the Wabash River to Vincennes, crossing through the easternmost tier of Illinois counties. Sometime before October 1869, the track was laid through the future Village of Beecher. By January 1870, there was complete rail service to Chicago. The railroad assured Beecher’s future. Chicago was just 37 miles to the north by rail, and from there, connections could be made to any part of the country. Then in 1870, Mr. Miller asked George Dolton to lay out the future village, with a business section on both sides of the railroad, and beyond that, twelve blocks on each side for future development of homes and other businesses. The streets of the original village were named for relatives and business associates of T.L. Miller, the founding father of Beecher. With efficient rail service running through the new village, further development began to build up near the railroad. By the end of the century, there was a thriving business section in the heart of the village. The depot became the center of activity. It was located on Reed Street, between Hodges and Penfield and was built in 1881 by the Chicago, Danville & Vincennes (CD&V) RR. The Chicago & Eastern Illinois (C&EI) RR took it over and operated it until the 1960’s when it closed. The depot was sold and moved to Monee, Illinois to Thompson’s Winery where it was used as a gift shop until the 1980’s. It was returned to its original site in Beecher in 2000, and renovated to its present state. It is a standard wooden depot and one of the last of its kind left on the former C&EI route. It is the home of the local historical society and is open on Saturdays from 10 a.m. until noon. 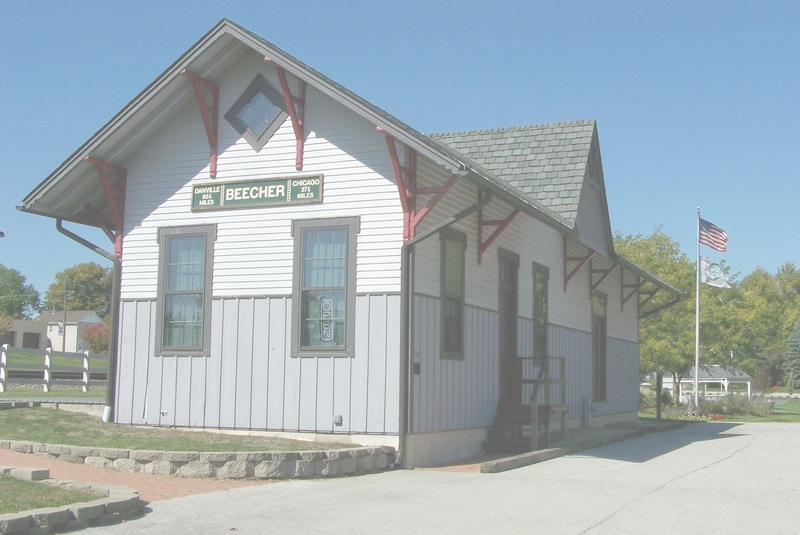 If you would like to learn more information about the Depot or would like a tour of the Depot, call the Village Hall at 708-946-2261 and ask to be put in contact with Don Sala or visit our Historic Preservation Commission page.